Would this work for 95 ford mustang GT. I wanna get the sequential lights so i need to buy the 96 tail lights for it to work. 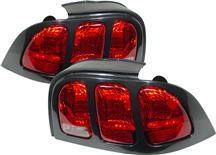 These will work on a 95 gt, you will need to have the 96-98 tail light harness as well. Yes, these will bolt in place of your factory lights, but you will need to use the oe style or sequential harness setup of the 1996-98 style lights to work properly. Thanks!